Home / Food/Nutrition / Is it Worth Spending $30 on a Jar of Honey? I am a huge fan of honey, I love to use it as a natural sweetener on my oatmeal or toast, in baked goods, on burns (yes it does help), as a face or hair mask and in salad dressings. Throughout this pregnancy with the twins, I’ve had crazy cravings for peanut butter and honey on toast or whole grain waffles. I sometimes add banana and cinnamon as well. My boys must be snobs or have really expensive tastes, because the honey I crave the most is Manuka honey. If you haven’t heard of Manuka honey, it’s produced in New Zealand by bees that pollinate the manuka bush. Yes most good quality manuka honeys will cost around $30 or so a jar; but I think it’s worth it! Honey protects against damage caused by bacteria and has been known as a natural healer for years. Honey has an anti-inflammatory action that can reduce pain and repair tissue that has been damaged by infection, Not all honey is the same, because there are so many varieties; and the way honey is harvested, varies from type to type. Manuka honey may be much more potent than others because it not only contains hydrogen peroxide; but also another antibacterial compound called methylglyoxal or MG. MG is usually only found in very small amounts in other honey; but in manuka honey it is quite high. The higher the concentration of MG, the stronger the antibiotic effect and honey makers have developed a scale for rating the potency of manuka honey called UMF (Unique Manuka Factor). When choosing manuka honey you want to make sure it’s potent enough to be considered therapeutic because you’re spending quite a bit of money! Look for a minimum rating of 10 UMF or the label Active Manuka Honey. I personally just love the taste of manuka honey and the fact there are so many added benefits makes me feel great. I splurge on a jar; but it also lasts me quite a while. You really only need a small teaspoon because the flavor is so rich and sweet. If you’re going to do hair masks or face masks, you most likely will want to use a cheaper brand of honey, although manuka could make a difference, I will have to test it out. For antibacterial uses, try small amounts of manuka on burns, dry skin or eczema. For larger infections of course check with your doctor first. You can find manuka at your local health food store, Whole Foods, or natural foods section at your grocery store. 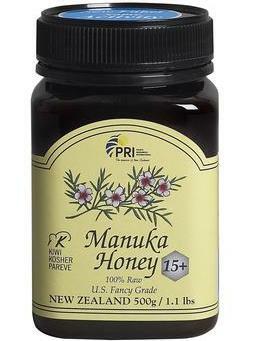 My personal favorite brand is Pacific Resources International manuka honey. If you can’t find it at your local store, you can buy it online. Pacific Resources also makes a flaked salt I love to use on my avocado toast. I’m curious to know if you’re already a fan of manuka honey or have heard of it before. Pacific Resources International would be happy to offer all of my readers a special 15% discount and free shipping on their Manuka honey, sea salt and their entire product line. Go to www.shoppri.com and type in discount code FEAST15 when checking out!!! Boxtera--A Box Full of Incredible Healthy Snacks!